Khan Market Feels In G-Town? The idea is to recreate a sense of quaint charm and make it Gurgaon’s Khan Market. Ahem, don’t know how close they’ll come, but for now, we’re kicked about seeing 35 restaurants (including some Michelin star ones), shopping pop-ups, co-working spaces, high-street fashion brands and more set up shop here. We already told you about Carnatic Cafe opening. Blue Tokai, Ping’s Orient, Pot Belly, GreenR, ATM and Pinxto (French cuisine), Dough Boy (gourmet pizzas and burgers), Laut (a USA-based Michelin star, Malaysian cuisine brand) and The Clock Tower (a microbrewery, yay!) are other restaurants you can hope to see as time goes by. They’re looking at 15 of these opening by mid-December. Get our drift already? 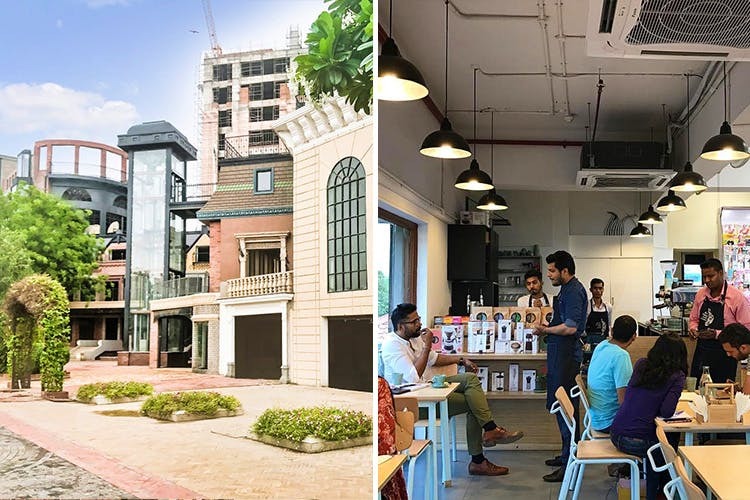 They’re trying to become a young, hip hangout where office folk from nearby places can come work, grab lunch, drink beer after office – or just plan a family day out. P.S. A little birdie tells us that we can hope to see a skydiving arena and an infinity pool in the future as well. Excited about meeting 32nd Avenue? We sure are.